IdealInsight: The Rise of the Apps – Will Banks take the Hint? Over the past decade we’ve seen a smooth and rapid evolution from complex do-it-all applications to slick ‘1 click’ apps. 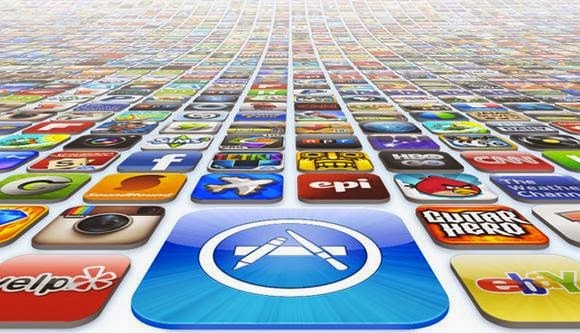 The most successful apps are those that perform 1 or 2 activities, but they do it so well they become indispensable. We now have apps that can enhance every part of our lives – an alarm app to wake you earlier if the weather is bad, a ‘design & order your own pizza’ app, you can even learn French – just from clicking on an app. We also have an app that literally does only one thing – says Yo! It’s been called ‘stupid’ by US TV host Stephen Colbert, but more than 300,000 downloads in 6 months and a $1.5 million VC investment says otherwise…. The rapid penetration of the smartphone has facilitated a quantum leap in application design. A 2012 study by Nielsen mentions that US smartphones had an average of 41 apps installed back then, this number could well be above 50 by now. Taking into account that the average American spends over 60 hours a week ‘using’ their smartphone, that’s a lot of potential app exposure. Take a test on your smartphone, how many apps do you have – and how many of those do you use? It seems we don’t mind the number of apps as long as it’s well within reach of our fingertips, does what it’s supposed to do and does it well. But this blog is not about apps, it’s about banks! It’s about how we’re moving from big do-it-all providers to small, specialized ones - as long as the specialized ones do what they do extremely well and are available, just like apps, at our fingertips. This is beginning to play out in the financial services landscape where customers in much of the developed world are moving from big universal banks to financial institutions with a much leaner, customer focused and dedicated approach to the services they provide. A barrage of these new, small, specialized financial institutions are vying for headroom by carving unique positions across the UK, Nordics and Northern Europe and this could well reach much of western and southern Europe once confidence returns to the market. Some of these players focus on the second tier of credit to personal customers (whom the large financial institutions won’t lend to), others on the growth of small businesses by enabling P2P platforms for SME customers to raise funds. Yet others focus on deeper credit scoring models that evaluate credit for mortgages, not only by taking into consideration property values, but also customer behavior, family status and by employing unique profiling methods to price the risk better. A clear indication of this shift is in the Nordic region, with the large movement of deposits from the big 4 banks to these smaller, but better yielding, disruptive financial institutions – the big 4 are the biggest losers because they are trying to be all things to all men, the smaller ones the biggest gainers because they’re lean, agile, digital savvy and focused. But is this rise a flash in the pan? Will the big banks strike back? Can these institutions hold out to win the day or will competition drive them to extinction? In next week’s blog I will explain the 4 major ways that banks can take a cue from the ‘Rise of the Apps’ to help them address the current Fintech climate and conditions that are confronting them. Premkumar Bhagwatsaran is the founder and CEO of IDEALINVENT which provides product innovation in the BFSI software space. With more than 17 years of industry experience gained by working for leading banks and banking software companies, he leads the team from thought and conceptualization of products to implementation.